The Alte Oper (German for "old opera") is a concert hall in Frankfurt, Germany. It is where the finale of the Club Nintendo comic "Sag niemals Holerö!" took place. The comic is about an evil alien called KKDU who attempts to transform all human beings into food in order to serve them to its alien fellows. 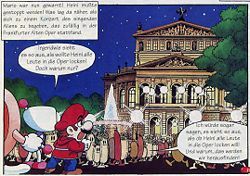 KKDU has a human crooner disguise called Heini, and during the events of the comic he is going to perform a concert at the Alte Oper. Mario, TicToc and Bomberman, who came there in order to stop the alien, get into the building through the back entrance. They stumble across some of KKDU's fellows cooking and get arrested in a toilet stall. Using their magical powers, however, the friends manage to escape, just in time to notice Heini turning into his true form and starting to serve the meal to his alien fellows. TicToc and Bomberman freeze time and throw bombs, respectively, while Mario saves the food people. They get out of the Alte Oper, after which it explodes. This page was last edited on November 13, 2018, at 22:59.